Every chicken keeper knows the feeling when a friend comes to their house and wants to pet the chickens and you have to tell them that it is not a good idea to pet that particular chicken due to their pecking humans habit. It is kind of dumb when you have to tell that sort of thing to a friend and what we at the typesofchicken.com team want to do for this article is take away that awkward feeling from our readers. How to start raising friendlier chickens you ask? You have to start as early as when they are only 3 days old. First avoid any physical contact – because they are scared of you as you will be scared of any skyscraper walking towards you. Give them some time to get used to your presence and once they have adapted to their new environment in a few days or so. Slowly start putting your hand among them and let them walk all over it. 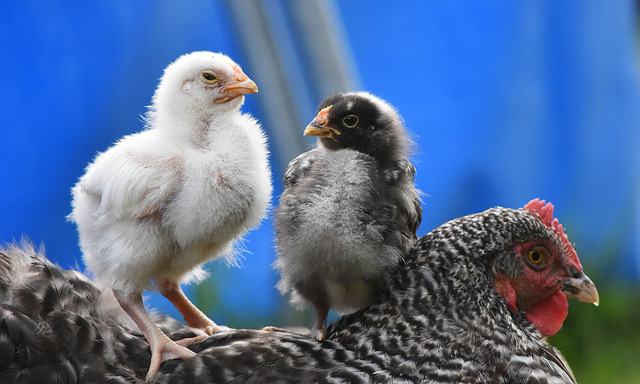 This is a simple method for your young chicks to adapt to your presence and that will make it easier for you to raise them into friendly, healthy and happy chickens. Letting your chicks eat out of your hands can make them enjoy your presence in their close environment. Do this more often and when they see you they will run towards you instead of running away from you. After your chicks get used to your presence you can slowly begin to try and hold them. IT IS IMPORTANT THAT YOU ARE PATIENT WITH THEM. They will not jump into your hands right away – it may require a couple of attempts but once a small chick gets into your arms and let you hold it you can know that you are doing a good job raising friendly chickens. When your chicks are in your hands you can try talking to them, in this way they will learn the sound of your voice. If they learn the sound of voice it will be easier for you to call them and they will know that they hear the voice that is giving them food, water and warmth. Stress can literally kill chickens – especially the small ones. Fear creates stress in small chicks and even if the stress does not kill them it will make them more prone to illnesses and bullying. If your chicks are still afraid of you while you try to pick them up or feed them using your hand the best thing you can do is back off a bit and take things slower. It is very important that you don`t scare your chicks in the process of raising them properly. If your friends want to hold one of your chicks remember that the smartest thing you can do is take the chick yourself and then give it to them. Tell your friends not to try to pick them up themselves if the chicks are not familiar with them, they may end up getting pecked at. Previous Article Do You Have An Egg Eater In Your Flock? Here`s How To Stop Them! 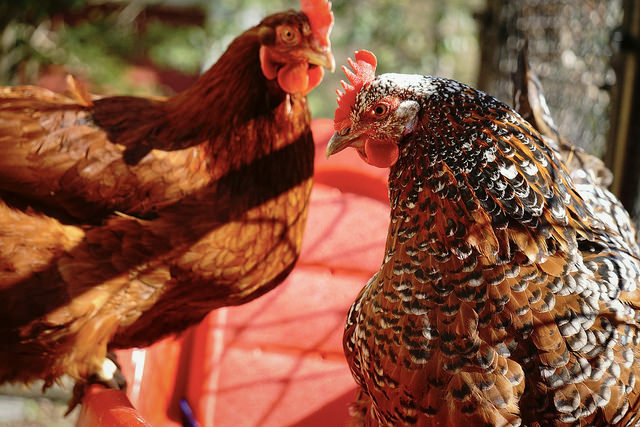 Next Article Why Are Chicken Dust Baths Important? what breed is the chicken in the middle on the first picture – the one with the flop over comb? I like!!!!!! !